On November 29, 2002, in the early morning hours, my special & sweet boy, Nick, went peacefully to Rainbow Bridge in my arms. I know he will be waiting for us to join him there as soon as our time comes but until then, his spirit lives within our hearts and in cherished memories. Till we meet again, rest in peace my sweet boy! Love Mom, Kahlua, Allie, Jasper and your best bud, Felix. Below is a poem given to me by Jodi Martin of Westsett Boxers Reg'd, who was one of the many wonderful supporters of Nick throughout the years. Thank you Jodi for your advice and friendship during a very difficult time! And thank you to all my good friends and the many other supporters of Nick. Each of you made his journey through life very special indeed! I'm the warm moist sand when you're on the beach. Just look for me, friend, I'm everyplace. 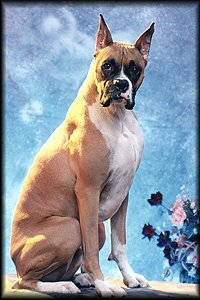 My love for this breed began with the purchase of my first Boxer, from Carol and Raymond Rath (Bellegary Boxers) of Stavely, Alberta (now in Ontario), a semi-flashy fawn male, Bellegary's Jolly Old St. Nick (Nick), as a companion and potential competitive obedience partner. I can still remember the day we got Nick, as he did a couple of "victory" laps around the circular driveway! He had such a "happy" look to his face which is something I will always remember about that day. I, like many others who have had no experience in owning a dog, let alone a Boxer, had a great friend to help me through the ear tapings, gave me advice when I needed it and inspired me to train in obedience competitively. This person is my good friend, Karen Oxtoby of Bravo Boxers. 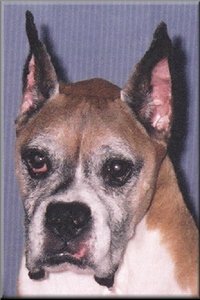 I had originally contacted her when I was first looking for a Boxer.....she directed me to reputable breeders and invited me to come watch her train her two obedience Boxers, OTCH Kemsey's Kascius Klay (Oggie) and Zephyr's China Doll CDX (Chynna), at her class at a local training facility. I was in awe of how her dogs performed and I knew after watching her train her dogs that I also wanted to compete in obedience. Karen then told me that both dogs were entered in trials at an upcoming Red Deer show and invited me to come watch. Well.....if I was in awe at the training session, I was blown away at the trials! She and her dogs have been an inspiration from the start and still are. I thank her for all her help, inspiration and encouragement. You are truly a good friend Karen! I have also met some of my closest friends through showing Nick in obedience trials and attending dog shows. My good friend, Josie O'Reilly of Summer Boxers, has also been an inspiration in the obedience ring with her Boxer, OTCH Starview's Kafka (Kafka). I met friends, Merv and Sandy Bilton of MGM Boxers, who were showing in obedience trials at the same time as I was with Nick. Merv and Sandy own Kahlua's sire, Am/Can. Ch. Ajay's Alfred Sung (Rico). After many hours of training, Nick and I have competed successfully in licensed CKC (Canadian Kennel Club) trials. We earned our Canadian CD (companion dog) title in our first three trials, and though it was a long haul (it seemed like it was at the time), and many more trials, we also obtained our Canadian CDX (companion dog excellence) title. Nick never really enjoyed obedience as much as I did, and still do (VBG), so I decided to retire him after we obtained the CDX title. It was a struggle to get that third and final leg (not to mention the other two) and that struggle was what made me decide not to continue at the Utility level with him. He definitely prefers the couch (VBG) to obedience! Nick's favorite activities include eating, sleeping on the couch, the bed, whatever spot is handy, playing with the puppies, getting a face wash from his buddy, Felix the cat, sleeping some more (VBG), eating......well you get the idea!